The federal lawsuit highlights decades-long, widespread DHS violations of detained immigrants’ rightful access to counsel in civil immigration prisons in multiple facilities in the Southeast. 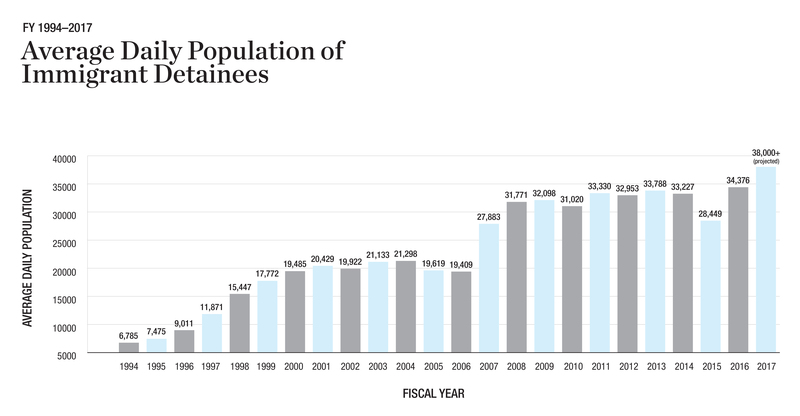 This graph tracks the average daily population of noncitizens held in immigration detention from FY 1994-2017. It describes how the defendants maintained policies and practices that prevented detainees at the LaSalle Detention Center in Louisiana and the Irwin and Stewart detention centers in Georgia from meaningfully accessing and communicating with legal counsel, preventing the SPLC from effectively representing them. It also outlines how the defendants’ conduct violated the SPLC’s First Amendment right to represent civil detainees. According to the suit, these facilities lacked a sufficient number of attorney-visitation rooms. For example, the LaSalle Detention Center had only one attorney-visitation room for up to 1,200 noncitizen detainees. As a result, SPLC attorneys and volunteers were frequently forced to wait for hours – often as long as two or three hours – to see a single client, and sometimes were blocked from seeing their clients altogether. The suit also describes the hostile and obstructive conduct toward legal visitation at these facilities. The obstacles were not anomalous but reflected the defendants’ long-standing and protracted policy of detaining noncitizens in remote locations to speed up the national deportation machine. A substantial number of noncitizens were eligible for release on bond or their own recognizance, and many had compelling claims for relief. Yet without lawyers, they were significantly less likely to succeed in petitions for bond or to prevail on the merits of their claims, instead languishing in detention or being deported to face an uncertain fate and possibly death. In 2017, the SPLC launched the Southeast Immigrant Freedom Initiative (SIFI), a project to enlist and train volunteer lawyers to provide free legal representation to detained immigrants facing deportation proceedings in the Southeast. About 250 volunteers, including attorneys, law students and interpreters, came to the South to offer free assistance, only to have client meetings delayed or denied, or were unable to communicate with clients due to limits on electronics that could aid interpretation. When the lawsuit was filed in 2018, the LaSalle, Irwin and Stewart facilities had among the lowest attorney representation rates in the country, and the impact was substantial. According to a 2016 SPLC report , immigrant detainees with access to lawyers were 10.5 times more likely to win their cases, compared to detainees without a lawyer. Once released from detention, detainees with lawyers were nearly 20 times more likely to prevail in their cases than detainees who represented themselves. Meanwhile, people with lawyers were almost seven times more likely to be released from detention centers than those who did not have the help of a lawyer. Kilpatrick Townsend & Stockton LLP and the Law Office of Melissa Crow served as the SPLC’s co-counsel.